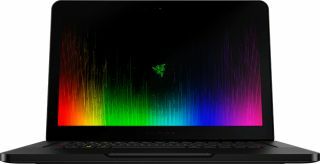 Razer doesn't want its 14-inch Blade laptop to become dull as new products and technologies came out. Having already updated the system's graphics to a GeForce GTX 1060 GPU based on Nvidia's Pascal architecture last September, Razer has gone back and swapped out the CPU for a Kaby Lake chip. The new Blade now comes equipped with an Intel Core i7-7700HQ processor, a quad-core part clocked at 2.8GHz to 3.8GHz. It replaces the previous generation Core i7-6700HQ, a slower clocked (2.6GHz to 3.5GHz) Skylake chip. It's not a massive upgrade by any means, but bumping up to a Core i7-7700HQ makes the Blade a little faster and more power efficient than last year's model. Razer also swapped out the 16GB of DDR4-2133 RAM for slightly faster DDR4-2400 memory modules of the same capacity, and added a 4K Ultra HD (3840x2160) display option with multi-touch support. "The Razer Blade sets the benchmark for performance in thin laptops," says Min-Liang Tan, Razer co-founder and CEO. "More users embraced this flagship computer model in 2016 than ever before, and we are excited to make it even more available worldwide this year. Beyond gaming, it has been really gratifying to see people enjoying the power and portability of the Blade for video editing, music creation and software development." Buyers can now opt for a 1TB PCIe M.2 SSD, in addition to 512GB and 256GB capacities. Other features include 802.11ac + Bluetooth 4.1 connectivity (Killer Wilreless-AC 1535), three USB 3.0 ports, a single Thunderbolt / USB-C port, HDMI 2.0 output, 3.5mm headphone/mic combo port, 2MP webcam, and a Kensington security slot. This is still a thin and light system measuring 0.70 x 13.6 x 9.3 inches (HxWxD) and weighing 4.1 pounds (Full HD) or 4.3 pounds (4K). You can order the Blade with Full HD display now direct from Razer starting at $1,899 (£1,799). Select retailers will carry the laptop beginning February 20, with worldwide availability slated for next month. The 4K model will be available in the second quarter.